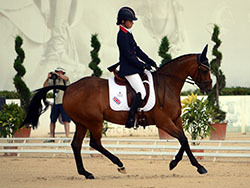 The last of the British riders, Phoebe Peters, was first of the top nations to ride. so had to go out and get the highest score she could with Danish-bred SL Lucci (Lukas x Bazar). Last year Phoebe and Lucci were the highest scoring British combinations achieving 70.923% in the team test but since then their international scores have been improving and they scored 76.41% at the Compiègne CDI in May. Phoebe was not just good, she was phenomenal! Lucci spooked just before the bell went but Phoebe kept calm and reassured him before going in and riding the test of her life to score her personal best in this test internationally and get an amazing 77.795%. This lifted the team into Silver place behind the Germans with the last riders for Denmark & The Netherlands able to influence the results. With the British and Danish supporters watching nervously, the last Danish rider seemed to feel the pressure as for them to reclaim the 3rd place she had to score over 78.334%. 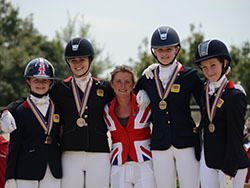 Although she got hgh scores for some movements, mistakes in other parts of the test meant that she scored 71% and from that point on the British girls were guaranteed the BRONZE medal - their first medal since 2007. There was even a slight chance of silver, depending on the score achieved by the last Dutch rider, but they held their nerve and gained 73.718% for team silver with Germany guarantee to win their 22nd Team Gold before their last rider even went! The British team final average score of 73.222% way exceeds their previous best final average of 70.333% and shows both the quality of ponies and riders in the team this year and how hard they've worked to improve. All riders do go forward to the Individual round, which takes place on Friday afternoon and Saturday morning. 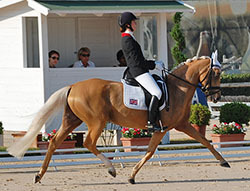 The first session of the Eventing Dressage featured one of the GB individuals and the first two of the team riders. First to go in were team members, Libby Seed & Mr Vick (breeding not recorded), and they produced an accurate and obedient test for 49.2 penalties and took the lead at that stage of the competition. Later riders did score more, but Libby & Mr Vick were well placed in 5th at the end of the day. just 4 points behind the overnight leaders. 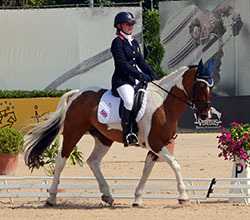 Next for GB were the individual combination of Chelsea Pearce & the British bred and SPSS graded mare Catherston Nutsafe (Catherston Nightsafe x Dutch Courage) and they also did well, scoring 49.6 and finishing the day in 6th place, just behind Libby. Last of the GB riders today were Charlotte Bacon & Three Wells Breeze (breeding not recorded) and they just dropped a few marks, but still scored a creditable 50.8 and finished in 8th place. At the end of the day, the British team were in third place, just 0.4 penalties behind the German team, with Ireland in the lead (2.9 penalties ahead of GB). The remaining team and individual riders do their tests early on Day 3. 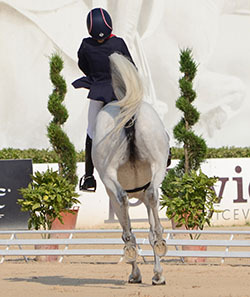 The first part of the Jumping European Championships is a single round, up to 1.30m in height, against the clock that counts towards the Individual Championships. The course proved tricky with a number of ponies refusing at the first fence and some being eliminated for 2 refusals. The first rider to go clear was the 9th on the the course, Megane Moissonier (FRA) & Jimmerdor de Florys and they got a big cheer from the spectators. 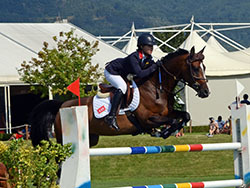 The GB riders did well with 2012 double Gold medal winners, Millie Allen & Song Girl (breeding unknown) getting off to a great start with a fast clear and third place. Emily Ward & King Mac (breeding unknown) were also clear but 0.32 of a second slower, so finished in 5th place. 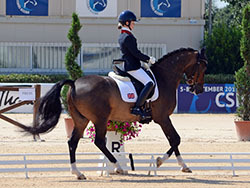 In between Millie and Emily was the British-bred pony Rock Dee Jay (Arko III x unknown) with Susan Fitzpatrick (IRL). 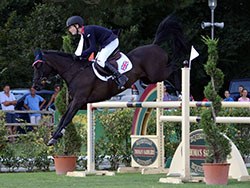 The third British clear was achieved by Faye Adams & Some Like It Hot (breeding unknown) who were slower for 13th place. The other GB combinations, Amy Inglis & Lea du Genier (Balkh d'Aigremont x unknown) and Alex Gill & Ammanvalley Santino (Cruglwyd Sant x unknown) both had 4 faults and finished in 20th and 22nd places respectively. However, as this was just the first of 5 jumping rounds that determine the Individual Jumping Champion and faults are carried forward, a score of four faults is not a disaster - especially when of the 54 ponies entered in the Individual competition, 3 were eliminated and 16 had 8 faults or more. The scores in this first stage of the individual competition are not carried into the Team Competition where all teams start level. 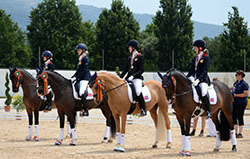 One pony jumps from each country in turn, then the team positions are calculated on the best 3 scores. The top 10 teams (and this includes any in equal tenth place, so there may be more than ten) will then go forward to the second round. The order for the second round will be for the lowest placed team in the first round to go first, with the highest placed team going last. If teams are on an equal first round score then they will retain the order of the first round. along with any riders. Individual riders through to the second round will jump first. The final team results are calculated by adding the best 3 scores from each of the 2 rounds. If there is a draw for 1st, 2nd or 3rd place, then those teams jump off against the clock with all team riders taking part.